This is not exactly modding per se, but it does have to do with the files of NS2, so I thought I would share it here. I've written a small tool to extract the sound samples of FSB files, and I just recently made it compatible with the FSB5 format, which is what NS2 uses now. I'm aware of the FMOD Designer program, but if all you need is to extract and play the music, then you don't really want to install a large program. With the tool, you can display and extract the sound samples contained within an FSB file. FSB stands for "FMOD Sample Bank". Supports the FSB3, FSB4 and FSB5 file formats. Currently, there might be a few issues with FSB5, but the basics should work. This program was originally made to open the FSB files of "Dragon Age", but has since been expanded into a general FSB Extractor. FsbExtractor13.03.09.rar - Support for FSB files with basic headers. FsbExtractor13.02.11.rar - Proper FSB3 and FSB4 mode flags. Changes to how the WAVE header is written. FsbExtractor13.01.13.rar - Properly detects FSB5 sample format, including Ogg Vorbis. Fixed a few errors. FsbExtractor13.01.04.rar - Samples with same name no longer overwrites each other. Directory listing for other FSB files in same folder. FsbExtractor12.12.20.rar - Support for command line parameters and detailed verbose logging. FsbExtractor12.07.03.rar - It now fully supports all FSB5 files of NS2. Ahm, could you please pass me the last piece of that delicious nubcaek? nice, this would probably work for most games that use fmod very useful. Btw, I was looking at this FMOD designer the other day, for example to add a new sound into the game. Don't you need the project file in addition to the fsb and fev files in order to do that ? Could we get it ? It does indeed. It was originally made to extract the music from Dragon Age Origins, then later, I found out that there are actually many games that uses FSB files, and it worked for those games as well. The FSB5 format which NS2 just switched to, has a quite confusing data structure, there are actually a few of NS2's files it cannot properly play yet. yes u would need the project file, ive let charlie know that this should be given out with the builds, he agrees, it just hast happened yet but it will, probably for version 1, ill also do a nice tutorial on how to get your own sounds into the game. ill also do a nice tutorial on how to get your own sounds into the game. Sounds great! I would love to see something like a video series covering most important stuff in FMOD. Anyone got a link to this that works?? There if anyone else is looking. or, your website is offline? Nice tool! I extracted the exosuit's voices ("Initiating system"). Is there a tool to build FSB5 files? I'd like to overwrite some of the origical sounds and make a sound mod. Any news on the project files simon? I'd really love to look deep into customization, like randomization and pitching of sounds etc...I guess we need the project files for that? 'FsbExtractor.exe'. Read of address 00000004. The program doesn't crash, but if i then dump that file out the RIFF header looks fine but if i try and play it back in various programs it doesn't work, in foobar2k it gives me: Unsupported format or corrupted file. I can provide example files if you'd like. Which program are you using to unpack the assets pack files of PlanetSide 2? After unpacking a few FSB data from the pack files using a hex editor, they seem to be stored in the ADPCM format, and there has always been issues with that format and getting it to play properly. I will advice using VLC for playing ADPCM format files. I'm interested in knowing how you made the program crash, which pack file and specific FSB file made this happen, all of them? Also, are you using the latest release, since I did fix a few errors in the one I put out a few days ago. I was just looking for a tool like this great! I have a python(2.7.3) script which unpacks all the .pack files into their individual asset, the game has 81k FSB files, i guess most of them are samples. Hopefully this post will be of some use to you. ##a pack file has several parts which are all identical in structure. ##	strings prefixed with uint32 length, no trailing zero! Thanks for getting back to me on this. 81k FSB files, whoa, that is a lot. Wonder why they aren't packed together? After checking out those FSB files you linked to, I did find two minor bugs, but nothing that would lock up the program and cause the HD and memory usage to freak out. One of the errors would happen when you dragged and dropped a file to open it, the other was just a small display error with the "unknown extra id number". The noise/static you get is as I mentioned before, they're ADPCM files, and they are compressed in a special way, different to regular ADPCM files, that I have no idea how to play back properly. VLC can play some of them, Natural Selection 2 for example, but not all. I'll update here if I figure out more. I actually forgot to upload one of the problematic files that freaks out your tool, maybe it's not a sound file at all but something else? ADPCM was used on the GameCube and had it's own compression type so i check that and it's not one of those, but i know people(over at encode.ru) who if anyone is going to know it'll be them or one of their colleagues in the world of compression, although they aren't specifically working on sound stuff but may have an idea if it's a known algorithm and not some private FMOD one. After looking into things more, I realised I missed an important part of the FSB5 format. Some of the samples for PlanetSide 2 are stored as Ogg Vorbis. They are without any headers though, so I don't know how to play them, perhaps I can find a way to attach a dummy header to this data? Will have to read into the Ogg container format. Some samples are however in ADPCM, and just like some of the ADPCM samples in NS2, they won't play properly even when using the in_xbadpcm Winamp plugin from here. ADPCM from what I understand is encoded using a common conversion table, and perhaps FMOD is just using their own specific tailored one for the FSB files. The new release will show the PS2 samples as being Ogg Vorbis. Just make sure to disable the "Add Wave Header" option, as I didn't turn that specifically off for the Vorbis format. Or perhaps some players will work with the data better in a RIFF WAVE container? Hi Aezay. I was using your Extractor a few months back, but my backup program didn't save the actual extractor. Your personal site's unavailable, so I was wondering if you had another upload of it? Thanks for all your hard work! Are you finding both http://aezay.dk as well as http://aezay.site11.com unavailable? Aezay.dk immediately redirects to aezay.site11.com for me, so yes. I noticed site11 is a subdomain for 000webhost. Don't they have a sort of routine maintenance or something that results in sites being unavailable for a bit? Could that be it? Edit: I was able to access the site and download to my dropbox from my phone, but for whatever reason my PC can't connect to the site. Weird. Seems while it is Ogg, PS2 uses some newer FMod stuff that does funny things to it so it may take a while for someone to figure it out. Aezay, you still here and visiting this thread? I was curious if you could add support for Vessel's new version of FSB containers. It does detect files but cannot extract properly (just some random mess in the end). A pity, because due to some legal issues the actual OST will never be available (accroding to studio head) and thus extracting tracks from game resources is the only way to get it in decent quality. UPD: nvm, extractor works fine, it is ww2ogg that cannot parse it. Damn. I believe this project file is in the assets folder included with game download now. I'll poke Simon again about getting a tutorial going for this. Can't find anything else that looks like it. I'd like to extract the chuckle sound to use as a text ringtone. I've tried the tool in the ns2 folders and several other things to no avail. Turned to this as the last attempt but the site in OP is unavailable. Anyone still got the latest version of the extractor? I'm trying to extract the music for a PC game : Might & Magic Clash of Heroes. 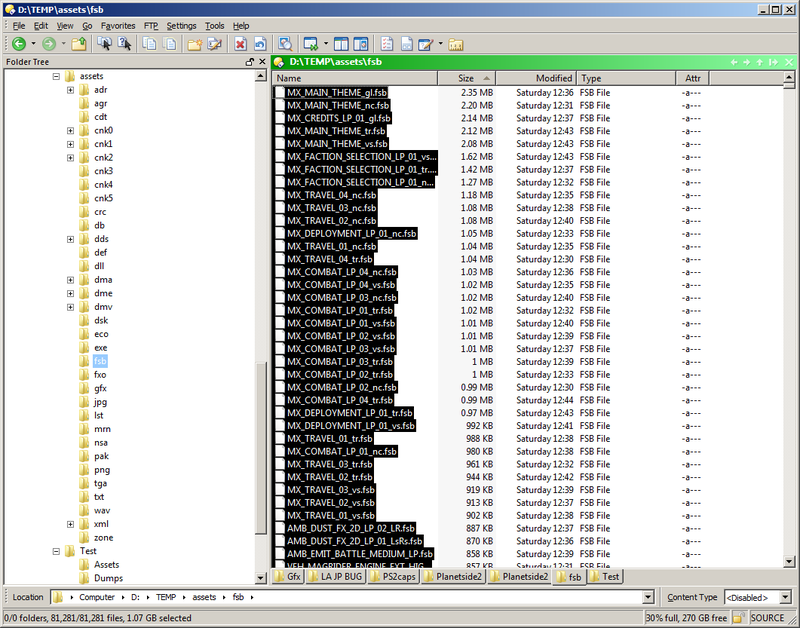 The res folder contains these two files (MMCoH_Music_Bank.fsb, MMCoH_Music.fev) amongst others. When trying to load the fsb with Aezay's extractor, the response is that the file is invalid. Is there another way to determine which fsb format (or variation thereof) has been used for this game? It's probably one of the "alien_2.fsb\taunt" or "alien_3.fsb\taunt*" samples, which all happens to be of the unplayable ADPCM format sadly. It's possible that those FSB files are encrypted, if you take a look at them in a hex editor, the 3 first characters of an FSB file should be FSB, otherwise it's encrypted or not an FSB file at all. The fourth character is the major FSB version, usually "3", "4" or "5". Thank you so much for your FSB extract tool. I would like you know that it works wonderfully on Star Trek Online's .fsbs. I have a feature request, however: is there any way to add all fsb's from a folder for mass convert using your tool, command or gui? I could find no such feature, even in the readme- although you gave instructions on how to run it in console mode, I would rather not manually list all of the files as stated- could you add this feature or is there something that I missed? What stuff u guys recomend to repack fsb data? If you are trying to make a sound mod, that isn't how you do it, you need to download FMOD designer and then make it in a .fev. You can search for a few tutorials on the forums. But I don't know of any FSB packers, other than the free FMOD designer which might do that.